Really… winning? Green? With a gold photoshop glow? Really? Well best add an exploding space ship in there too. Oh and some babe in a space suit completely ignoring the explosion. Hopefully that will distract from our winning colour. I’m still on the fence about the E. Moon book covers (aswell as the STEN series). They’re clearly pretty cheesey looking but at the same time they unmistakeably have a certain style (almost a brand image). And you’d see them and instantly know it was one of her books (although it could be confused with the STEN ones), I would be a difficult decision to republish them with different covers. I’m well over the fence on this one and way into the next field. I really think these covers aren’t too terrible. They are just really dam cheesy. The thought of a model actually posing for something like that. Ouch. Though the title is somewhat ironically, losing. Watch out! That little dagger-shaped spaceship is headed straight for your thumb! Ouch-alert! She’s not ignoring the explosion. She’s busy wondering how the hell she’s going to accessorise that minty green power armour. Oh the font! The font! Not only 3D carved effect but it glows. In 2 differant colours! No wonder the poor girl’s looking a bit self-conscious. You’re right MI, thats definately the default photoshop filter’s “Emboss” and “Glowing Edges” used in their full glory to excelent effect. The girl is turning away to cry because she’s upset she doesnt get glowing edges too. It’s not so bad; a good example of the ‘it does exactly what it says on the tin’ cover art approach for this sort of genre book. And the power armour is really cool. Which I find worrying about me. The armour is interesting. It seems to cover most of her vital areas. Luckily her face isn’t something deemed necessary for living. Now to be fair it could have a visor. It kinda reminds me of the old intros to games like Red Alert. Really cheesy character acting mixed in with a bit of drawn things on there. 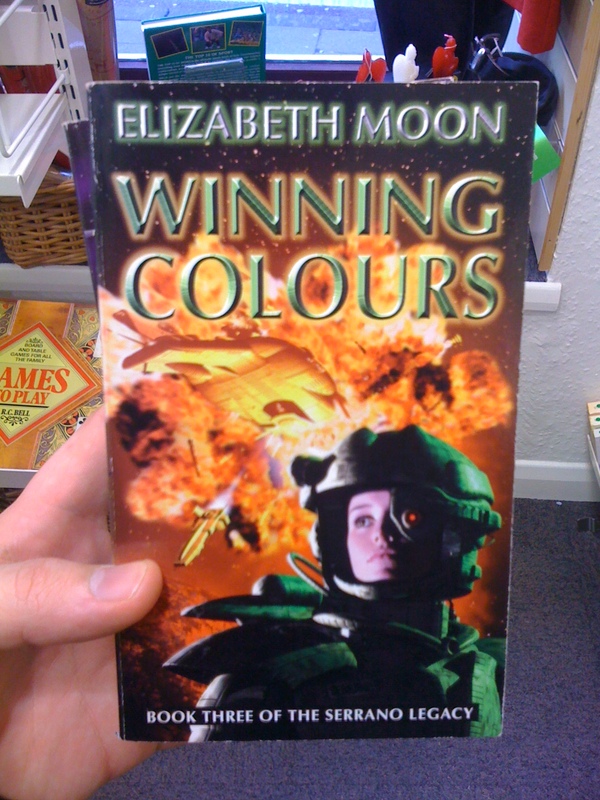 The thing about the first three books in that series is that they really *should* have had horses on the front cover. Instead, even the first one had spaceships. oh, I have this with a horse on the cover! will submit. that Orbit cover is not too bad, really, apart from who the hell is that girl anyway? Captain Heris Serrano, a 40-something black woman? Lady Cecilia de Marktos, a rejuved 80-something redhead (who doesn’t wear armour like that at any time)? I love my 1970s box set of the Earthsea trilogy (back when it was only three books) but not only is Ged pasty instead of ruddy brown, Vetch is pasty instead of dark-skinned black. cos everyone in the world (all worlds) is white (unless they’re green). @Nix: It REALLY varies. If the book in question is available in hardback or paperback on the regular market, SFBC’s version usually has the same jacket or cover art; if it’s an oddity – generally an omnibus edition – it’ll have a separately-commissioned piece. I’m sorry, wait, no I’m not. I rather like this. Space Marine, Space ship, explosions. Science fiction in no uncertain terms. Without the optic nerve scarring busyness of a Baen cover. Yes, not bad. And a great name for a SF author. Makes me wonder however if somewhere out there is an author named Hugo Nebula. But because he is a loner aand a rebel (Dotty) he refused to follow his parents plans, and is instead selling falafel from a street cart in Beirut while simultaneously scripting manifestos by night for a Neo-Utopian cult of Vegan Marxist Cthulhu worshippers. It says “Book Three of the Serrano Legacy”… and I believe it. The art is truly the legacy of ANDRES Serrano. Alright, had to Google that one. Good job, Mr. Yngve, good job! In other news, I really dislike this cover. The colors clash, the contrast is off, and it looks like a 3D rendered model was badly photo-shopped onto a painted background. I’ll grant that it’s possible that the photograph doesn’t do it justice. Locutetta didn’t like watching explosions.